The Tyranny of Distance launched the current era of Leo’s music with vigor, and it remains a standout part of a remarkable career. It wouldn’t immediately be clear who Ted Leo was becoming. After the stylish punk of Chisel and the experimental solo work of tej leo(? 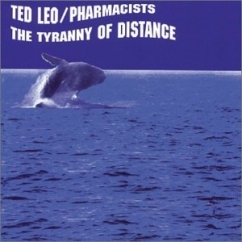 ), Rx / pharmacists, Leo could have gone a number of directions. Fortunately, he decided to go most of them. On The Tyranny of Distance, not much of that strangely titled album would show up (though some of those ideas would return later), but his sense of expansive exploration held. Returning to the punkishness of Chisel while creating more complicated songs, Leo challenged himself and his still-assembling band for a record as loaded with hooks as it is with sentiment and styles. Even 17 years after its release, Tyranny remains deceptively hard to pigeonhole. Is this punk or indie or something else? Is it personal or political? Does it have roots in the ‘70s or the ‘90s DC scene? And what’s with all this talk of Thin Lizzy (despite some explicit connection, the Thin Lizzy connection can feel tenuous, though it probably sent a bunch – a few dozen – indie rock fans into a new field of listening)? The answer, of course, is that the album is a little bit of all of this, and tracing out the difference between Paul Weller’s ancestry, Fugazi and even Leo’s own previous work remains part of the fun. If it were as simple as genre and history discovery, the disc would have long since fallen out of rotation. Instead, a dozen songs continue to reveal their depth and complexity. When Leo sings at the end of opener “Biomusicology” that “They may kill and we may be parted/ But we will ne’er be broken hearted,” it sets a tone for everything to follow, the fading end leading into the anxious strumming of “Parallel or Together?” and its sadly answered question. Leo’s response to the death of a relationship is to create a song, and Tyranny spends much of its run asserting its own existence in the face of decay. “Timorous Me,” the album’s highlight, most immediately addresses such concerns. The song opens with one of the bounciest guitar hooks he’s written. Punk purists may resist, but the pop and rock intersection here works perfectly. On the song, Leo details relationships with people who have left his life too early, tragically in at least one case. The track leaves a complicated emotional experience, recognizing both the regrets of things unsaid and the freedom (found jointly with Leo’s wife Jodi) of being able to find peace in a quiet space. The album’s other top track, “Under the Hedge,” relies more on its pile of imagery and language than on an explicit narrative. The song’s ostensibly about Leo’s interaction with a band or a musician that turned out disastrously (the internet happily provides variations on a Robert Pollard tale), but it sounds more like a (creepy) persistence in a difficult relationship. Whether Leo reacts to a musical colleague, a scornful lover or an on-again, off-again romance remains less important than the ambivalence mixed with energy provided by the song. While the album’s personal nature gives it some heart, the brief forays into politics give it an extra edge. “The Great Communicator” sounds like a confession, but it refers to Ronald Reagan and delves into debates about ebonics and more. “My Vien Ilin” makes a challenging statement merging anti-war sentiment (the album, from 2001, was released before September of that year) and psychological awareness. Adding to the mystery of the song, Leo references Korea and James Joyce, or maybe the Odyssey through Joyce’s Ulysses. Leo isn’t Joyce, but he likes his puzzles, and he, too, finds surprising energy even from morbid meditations. He moves restlessly. We haven’t even gotten to the lengthy “St. John the Divine,” a dub-influenced track that in some ways has more to do with later work than anything else on the album, or the steady thump of the nautical “Stove by a Whale,” possibly the best pop song ever to use the word “subcutaneous” while questioning the destructive nature of systemic sin and reminding listeners of nineteenth century maritime disasters. Leo isn’t Joyce, or Melville, but he’s willing to engage his big ideas with unusual songs and unflagging drive. The Tyranny of Distance launched the current era of his music with vigor, and it remains a standout part of a remarkable career.